Hello, how do you do? I am Sybil Lewis, and my Syblues famous box of recipes is among my most-prized possessions. I have been collecting these recipes from before my eyes were at my knees. It’s a comprehensive documentation of many of the delicious dishes that we as West Indians have gifted to the world and enjoyed for many lifetimes. My box has been the source of culinary delights for many generations worldwide. Devotees from North America, the Caribbean, Europe, Asia, and Africa regularly request dishes from the recipe box. This box will guide you well on your personal culinary journey in creating mouthwatering West Indian cuisine. 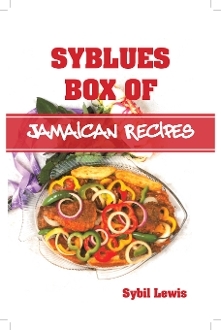 Now, start using Syblues Box of Jamaican Recipes to begin your own collection of recipes. However, I encourage you to exercise your own creativity and develop your own unique flare as you create your traditional gems. I wish for you many amazing cooking and dining experiences.